The following is a transcription of an article published in THS Bulletin 2  by Peter Bloomfield, then Deputy County Archivist at Gloucestershire Archives. That article was itself based on a talk Peter gave to the Society on 15 October 1992. And them the Cavaleers stole. This garrisons have all the gaine." These words, although from an old Somerset ballad, apply equally to the Tewkesbury area, and, indeed, to other parts of the country affected by the Civil War of 1642-1646. They reflect the exasperation of the majority of people who sought (not always successfully) to remain neutral, and who suffered at the hands of both sides. Tewkesbury was in a position of some strategic importance in the Civil War. First, because of its position in relation to Gloucester and Worcester, about ten miles from Gloucester and 14 from Worcester. It was advantageous to each side to hold Tewkesbury; if the Roundheads held it they could threaten Royalist Worcester, while if the Cavaliers held it they could threaten Parliamentary Gloucester. Again, its situation in relation to the Rivers Avon and Severn was of significance, as they provided a north-south line of trade and communication. It commanded a crossing point over the River Severn by ferry, and at one time during the war the Royalists were to build a bridge of boats over the river here. A force in possession of Tewkesbury could also command or threaten the bridge across the Severn at Upton, the only permanent crossing between Gloucester and Worcester. Whoever controlled Tewkesbury controlled passage over the River Avon, where there was a bridge, and a garrison here could dominate the fertile Vale of Evesham, which was significant as armies have to be fed. If the Royalists controlled it they could lock up a Parliamentary force in Gloucester, and this would make it easier for the king to move supplies from the areas he controlled in Wales to his capital near Oxford. So it is not surprising that Tewkesbury was much fought over during the war. It changed hands several times between the winter of 1642-43 and the summer of 1644. As to how Tewkesbury stood in 1642, there is a note in a volume of charity accounts in the Gloucester Record Office [now Gloucestershire Archives] which says that the town "was forward and active for ye parliament." It is apparent from this book, and from the Town Council minutes, that informed opinion was well aware of what was happening in the period leading up to the Civil War. It was the time of the controversy over ship money, for which Tewkesbury was assessed at £60 in 1638, to raise which, 243 people paid sums ranging from one shilling to £1. The town suffered from the slump in the cloth trade, and many local people were involved in the retail trade in cloth. There was also an attempt by the authorities to suppress the local tobacco trade. The crop had been grown in the Tewkesbury, Cheltenham, Winchcombe area since the 1620's, and some of the growers and dealers were based in Tewkesbury. Perhaps most significant of all. was the development in the town of a strong nonconformist movement, so there was Puritan resentment of the policies followed by William Laud, Charles's Archbishop of Canterbury. This added to the fierce anti-Catholic feelings of the time and meant that many Tewkesbury people would tend towards Parliament, rather than to the king with his Roman Catholic wife, Henrietta Maria, and his support of Archbishop Laud in his high church policy. Thus the Puritans were very much against the king, and they were prominent in the town. The much disputed elections to the Long Parliament in September and October 1640 had returned two Parliament men, Sir Robert Cooke of Highnam and Edward Stevens. To refer to Gloucester for a moment. Even before hostilities broke out in 1642 Gloucester was garrisoned for the Parliament, the trained bands were called out, a volunteer force was raised, stores were laid in and work began on strengthening the defences. In September 1642 a force was sent from the city of Gloucester to garrison Tewkesbury, and although it left after a short time, it had collected contributions to the value of £500. As to the conditions around Tewkesbury in 1642, Sir Robert Cooke of Highnam was commissioned as a colonel in the Parliamentary army, and yet his eldest son, William Cooke, was a Royalist. This division of loyalties within a family was not uncommon during the Civil War. All towns had their Royalist and Parliamentary sympathisers, but by and large Worcestershire to the north was Royalist, while to the south Gloucester was very strong for the parliament. Yet Gloucestershire itself was divided; a few miles east, Sudeley Castle, the seat of George Bridges, Lord Chandos (the Royalist Lord Lieutenant) was garrisoned for the King. After the raising of the royal standard at Nottingham, Charles I with the principal Royalist field army advanced very slowly south-west to Shrewsbury, building up the strength of his army as he marched. In the meantime the Parliamentary Lord General, the Earl of Essex, left London and marched his army on Worcester. Colonel Nathaniel Rennes was sent ahead to secure that city, but he had the misfortune to encounter the king's nephew, Prince Rupert of the Rhine, at Powick Bridge, south of Worcester. There was a short, sharp fight, a cavalry action, on 22 September, in which Rupert routed the Parliamentary forces and drove them back as far as Pershore. It was a small battle, but significant because of its effect on morale. It didn't stop Essex occupying Worcester, where he remained for three weeks. He left on 18 October, on intelligence that the king and his army were marching on London. What happened next is chronicled briefly in a local source, the Giles Geast charity account for 1643: "23 October 1642 a battle was fought near Keyton, in co. Wariwicke, where the kinge was in the fielde with duke Robert his nephew, & the Earl of Essex was generall for ye Parliament, & many hundreds were slayne on both sydes, the place called Edgehill." This, the first of the great battles of the Civil War, was indecisive. The two sides fought themselves to a standstill, but the Earl of Essex withdrew to Warwick, leaving the road to London open to the king. The Royalists then advanced as far as Twmham Green, where they came up against a numerically superior and very well equipped force, so they retired to Oxford, which became their capital. The first passage of arms of significance in Gloucestershire was the siege of Sudeley Castle, which yielded to Colonel Massey, the energetic Governor of Gloucester. He took Sudeley Castle on 29 January, after which the victorious Roundheads fell to plundering the castle, desecrating the church, digging up graves, breaking down the Chandos monuments and covering the nave with the blood and dung of beasts (according to a Royalist account). But this gain was more than outweighed by the Royalist success on 2 February when Rupert stormed Cirencester. After that, according to a Parliamentary account, the Royalist forces went into the country around the town and "tooke away all the horses, sheepe, oxen and other cattle of the well effected". They also plundered "cloth, wooll and yarn besides other goodes from the clothiers about Stroudwater". This led one Samuel Webb, a clothier, to obtain what is called a 'protection' from Prince Rupert, and another for good measure from Prince Maurice, his brother, to prevent this sort of thing happening. Giles Geast, referring to Cirencester, mentions that "1500 carried prisoner to Oxford". Upon news of the fall of Cirencester the Roundheads abandoned Sudeley and Berkeley Castles, and they yielded up Tewkesbury. Corbet, one of the sources for the period, and Colonel Massey's chaplain says, "the garrison of Tewkesbury was surprised with fear", so that the townsfolk sent an urgent request to Gloucester for reinforcements. Yet far from feeling that Tewkesbury could be assisted, a council of war in Gloucester decided that "the forces, ordnance, ammunition with all the well-affected persons should forthwith repair thither". Whilst Tewkesbury Council and the garrison were considering this, there arrived from the Royalist Governor of Worcester, Sir William Russell, a message offering the town conditions of peace if they would submit. After some confusion the garrison of 200 dragoons left for Gloucester, and on the seventh the town was delivered up to Sir William Russell, who installed a strong garrison. The inhabitants then had to find a contribution of £500 for the Royalist cause. Moreover, as the chronicler records in the Giles Geast Charity book, "hee tooke away all our arms", both from the town in general and those of individuals in particular, and sent them to Worcester. This Sir William Russell of Strensham Court was a very important figure locally in the Civil War, a notable Royalist and a devoted champion of the king's cause. He spent a great deal of money and effort in the king's service. In March 1643 Russell returned to Worcester, and appointed Sir Matthew Carew as governor in Tewkesbury. Meanwhile, there had been developments in the south-west, which were to affect the town. Lord Herbert, who was the King's Lieutenant General in South Wales, had raised in the Principality a force for the King, at a cost to himself of £60,000. In February he advanced with these troops through the Forest of Dean as far as Highnam, where they threw up entrenchments. The Commander of this force, Sir Jerome Brett, sent a summons to Colonel Massey in Gloucester to surrender the city, but he received a scornful answer. According to Corbet the Welsh lay for five weeks "in a stinking nest". Eventually Massey contacted Sir William Waller, one of the more able Parliamentary Commanders, and they planned a very clever combined operation. The Welsh were surprised at Higimam on 24 March, attacked from two directions at once, and although the horse escaped, 1500 were taken as prisoners to Gloucester. The effect on the Royalist garrison in Tewkesbury was immediate. Carew, hearing of Waller's approach, abandoned the town, and within 12 hours it was repossessed by Parliamentary forces. Captain John Fiennes was commander there with a force of 40 dragoons, but he did not realise that a much larger force, described by Corbet as "a gallant brigade of horse, commanded by Lord Grandison", was approaching Tewkesbury from Cheltenham. Fortunately for names Grandison's force was delayed when they met a man who gave them the impression that the Parliamentarians in Tewkesbury were far stronger than they were, and that they had many men and guns. This gave the Parliamentarians time to withdraw, though according to Corbet they had no sooner reached the end of the town than the enemy entered, "amazed to see themselves so miserably deluded". The Royalist account of the same affair says that some of the Roundheads ran into the Severn to avoid the danger. Carew now returned from Worcester and Prince Maurice appeared with a considerable force, reinforcing the garrison with 300 well-aimed men and store of ammunition. In the meantime Waller had marched into Wales, and the Prince came up with a plan to surprise him on his return through the Forest of Dean. Maurice had a bridge of boats made at Tewkesbury and crossed the Severn with a force of 2,000 horse and foot. He entered the Forest of Dean and formed a line between Newnham and Ross-on-Wye. But Waller outmanoeuvred him. He sent his foot and artillery across the Severn near Chepstow on the 10 April, and rushed through the Royalists' lines with his horse and dragoons at Newnham and Little Dean after a night march. Massey came out of Gloucester with 300 foot and two troops of horse to cover his retreat, and met him two miles from the city. The Roundhead commanders now drew up their own plan to take advantage of Maurice's absence, and, as Corbet put it, "the enemy's jollity at our supposed total defeat" to fall upon Tewkesbury. Massey advanced rapidly during the night, and daybreak saw his troops undiscovered in the vicinity of the town. According to a Royalist account, some of his soldiers came up the Severn in a boat. One detachment fell upon the Royalist guard at the bridge of boats and cut that link, to prevent any attempt at relief by Prince Maurice. Another force, described by Corbet as the horse and foot, coming up from Gloucester way, sent forward a forlorn hope to surprise the sentinel at the western gates. They climbed over the defence works and let down the drawbridge, allowing their main body to rush in. Carew and his garrison of 300 men were asleep, roused up as Corbet put it "into a shuffling, fighting posture and after half an hour to a nimble escape". Most of the common soldiers and several officers were captured, although Carew himself escaped. The Royalist newspaper was very scathing of its own side on this occasion; "a man may easily observe that His Majesty has lost more by the negligence of his own men than the power and valour of his enemies". Prince Maurice, coming up on the western side of the Severn, could no longer cross the river by the bridge of boats, as it had been destroyed, but the appearance of a large body of Royalist troops at the Mythe so alarmed Massey that he sent to Gloucester for reinforcements. Waller marched quickly forward, intent on seizing or breaking down the bridge at Upton, to deny the Royalists passage across the river, but he was too late. The Prince sent a force of 500 horse to take the bridge, and so was able to cross with his main force and advance towards Tewkesbury. He drew up his forces at Ripple. Waller came up with him on the morning of the 14 April 1643. Prince Maurice had chosen his position well; his army was drawn up in three bodies in a large field the hedges lined with musketeers. The Parliamentarians were short of foot soldiers, save for those that Colonel Massey had brought with him. They also lacked, as Corbel put it, "cannoneers that understood the business". They were not well placed to retreat, for in their rear was a narrow lane, two miles long. Waller's troops were drawn up on rising ground from which they descended a little towards the Royalist army. Their cannon opened fire, but "gave no show of the least execution". When he discovered the ambush of Royalist musketeers concealed in the hedges, Waller ordered a withdrawal into the narrow lane. The Royalist account of this battle, in their newspaper, also mentions the placing of the musketeers in the hedges. Waller had hoped to lead the Royalists into a trap, but his plan failed. His troops could not stand against the attack, and they quickly broke. A running fight then took place from Ripple in the direction of Tewkesbury. The Royalist account has "Roundheads flying from the sword", with 80 falling in the field and many more drowning in the river. Corbet's account is, of course, somewhat different he pictures more of a fighting withdrawal. It appears that only a few of the Parliamentary units fought well, notably the heavily armoured unit of Sir Arthur Haselrigge, whose men wore three-quarters armour. The rout only halted at the entrance to the straight passage near the Mythe Hill. There is a feature on the six-inch Ordnance Survey map showing on the east bank of the River Severn the 'Royal Hill', which is possibly where they halted. Marching to the support of the retreating forces, Massey was caught in another cavalry charge and nearly lost his life. He was rescued by an act of gallantry on the part of one of his officers. This was a comprehensive Royalist victory, but Maurice did not follow it up with an attack on Tewkesbury itself. He retired to Evesham, as the Royalist account puts it, "to comfort and refresh his weary troops after so long travel". Waller had been thrown off his horse in the heat of the battle, and he was "so sorely bruised that it was thought he could not easily recover". Sir Robert Cooke of Highnam was now appointed Governor of Tewkesbury, but he did not remain there for long, as he was ordered to march into the west with his forces, leaving the town without a Parliamentary garrison. Before they left they broke down the defensive works to deny the Royalists any advantage if they occupied the town, and Tewkesbury then remained without a garrison for several months. Sir William Waller passed through it in June on his way to attack Worcester, and came back through it when he had been repulsed. July 1643 was a bad month for the Parliamentary cause. Waller was defeated at the battle of Lansdown, near Bath, on the 5th and at Roundaway Down, near Devizes, on the 13th, and then on 26th July Bristol was stormed by Prince Rupert. This left Gloucester as the only considerable place between Oxford and South Wales that was held by the Parliament. The King was confident that Colonel Massey would yield the city when he was summoned to surrender. He came in person with his main army and established his headquarters at Matson House, but Massey refused to surrender. Gloucester then sustained a very close and dangerous siege between 10 August and 5 September. The prospect of a long siege must have alarmed the inhabitants of Tewkesbury, for it would bring with it the prospect of feeding and supplying the thousands of Royalist soldiers camped around the city. It was assailed by several armies, not just one, and the troops came from a long way around. According to Bennett in his History of Tewkesbury it was this that prompted the decision to send the two lawyers, William Hill, the Town Clerk, and William Bell of Sandhurst, to Gloucester to confer with the garrison and persuade them to surrender. William Hill said later in his defence that it was the Royalist Governor of Sudeley Castle, Sir William Moreton, who persuaded him to go. Moreton held Hill's son, Nathaniel, prisoner, "being then very sick and weake in body". Hill claims that Moreton offered to set him free if he ventured into Gloucester to try to persuade them to surrender. This idea of sending a couple of Roundheads to treat with Massey is said to have originated with the King's senior general, Sir Patrick Ruthven, who was against storming the city because the Royalists had suffered very badly in the storming of Bristol. Moreton, according to Hill, dictated what should be said. The meeting between Massey and the two lawyers took place on 24 August, but Bell and Hill were no more successful than the King in swaying their resolve to fight on. This episode leaves us with some humorous verses, about "two pettifog-ging lawyers who came of late". The siege of Gloucester continued until relief came from the army of the Earl of Essex, strengthened by the London Trained Bands. He marched to the city by way of Stow-on-the-Wold and Naunton, descended Prestbury Hill, passed close to Tewkesbury and entered Gloucester on 7 September. Meanwhile the King withdrew the bulk of his forces to the Winchcombe-Sudeley area. After re-supplying Gloucester, Essex marched to Tewkesbury, and there is a reference to this in the Giles Geast Charity accounts: "The Earl of Essex with his army came to this towne and staid 5 nights". Henry Foster, who was a sergeant in the London trained bands, recorded, "My Lord General summoned this town of Tewkesbury and demanded the twentieth part of their estates for the relief of Gloucester". According to another contemporary account, "he (ie the Earl of Essex) staid betwixt the enemy's forces and that garrison four days to give them more time to furnish themselves better with provision of victual, which was to be brought from Herefordshire and parts beyond the Severn since all the hither parts were before ransacked by the enemy". It is easy to imagine how the Royalist soldiers took supplies from miles around. The Royalists continued to harry Essex, and one action is described by Foster "On Thursday night the enemy did fall upon some of our troops of horse who were quartered about three miles from Tewkesbury (at Oxendon), of the regiment belonging to Sir James Ramsay; they slew many of our men and took many others prisoner. We took four of them prisoners, but the greatest loss was sustained on our side. Before we marched from this town the Lord General gave orders for the making of a bridge over the Severn near Tewkesbury, as if our intention had been to march with our army over there to Worcester." Essex had tried to deceive the Royalists into thinking that he intended to march north on Worcester, because he wanted to avoid a battle on ground not of his own choosing. He made a feint towards Worcester, and seems to have deceived the Royalist scouts, who were subsequently castigated for failing to report his actual course in time. He had marched 17 miles overnight on Cirencester. The vanguard of his force reached the town at one o'clock in the morning and fell upon the Royalist sentinels and guards. They were rapidly followed up by the Parliamentary foot who surprised two regiments of horse in their quarters and captured 40 cartloads of cheese and victuals. This was important, as they were very hungry, and it would sustain them on their march to Newbury, where a very bloody battle was fought, the first of the two battles of Newbury. They then marched back to London, arriving there on 20 September. Meanwhile, a little local incident, a successful raid, had occurred. One hundred and fifty soldiers from Gloucester and Tewkesbury under Captain Scriven plundered the home of Roland Bartlett at Castle Morton. Roland Bartlett had the misfortune to be a Roman Catholic, although he was well liked for his charity and his hospitality. His neighbours were away at Ledbury Fair, and Scriven seized "Mrs. Bartlett's watch, and there breaking open a chest and took away £600 in money, besides linen to the value of £60; in other rooms they found more money, plate, jewels, bracelets, &c. amounting to a great sum ... in their strict search they met with Mrs Bartlett's sweetmeats; these they scattered on the ground, not daring to taste of them for fear of poison". From Newbury King Charles sent Sir William Vavasour with a commission to raise forces in Herefordshire and the adjacent Welsh counties, and with them to garrison Tewkesbury. Vava-sour held the command of Colonel-General under Lord Herbert. He was commissioned to raise his own regiments of horse and foot, and fought with them at the siege of Gloucester and the battle of Newbury. He arrived in Tewkesbury in October with 700 men. Unfortunately for Vavasour many of these men were raw recruits, and when Massey advanced upon Tewkesbury with a considerable force on 1 November and fell upon them they quickly broke and fled. Corbet says that the party came up from Gloucester in what he describes as a "friggot", and the Welsh soldiers, unpaid and discontented, gave up the town and fled to Upton Bridge. About this time there seems to have been a very positive move for the King on the part of the local Royalist gentry, especially in the Cotswolds, on whose initiative Tewkesbury was regarrisoned. On 1 February 1644 Vavasour mustered a force 2,600 strong at Hereford and marched on Tewkesbury. His army in-chided troops that had been sent to Ireland to put down a rebellion just before the war began, and this addition of seasoned soldiers from the Royal Irish Army was a very valuable increase in the King's forces. They began to land at Bristol in December, they consisted of two regiments of foot under Colonel Nicholas Mynne and Sir William St Leger, and 100 horse. Vavasour marched to Newent, and garrisoned it with Colonel Mynne's foot, while he himself established more garrisons at Highnam and Taynton. There were also strong Royalist forces at Evesham, Pershore and Sudeley. Massey himself established outgarrisons at Prestbury. Boddington. Huntley, Hartbury Court, Westbury and Little Dean, but he was still hemmed in by Vavasour's field army. In January 1644 Prince Rupert came to Tewkesbury, where he appears to have conceived a grand plan to unite the forces of Vavasour and those of Sir John Wyntour, the King's commander in the Forest of Dean, with those centred on Cirencester and Oxford, against Gloucester. His activities cut the city off from the north side, and one of the Parliamentary writers of the time complained about "the intolerable oppression of the Duke of Plunderland and his plundering Cavaliers". Vavasour made an attempt on the garrison at Boddington House, which Corbel describes very briefly: "Hither he came up with 500 foot and two pieces of ordnance, fired his gunnes against the house and engaged himself in an assault. The place was maintayned by them within til a small party drew from Gloucester, the report of which (at three miles distance) caused Colonel Vavasour to draw off and return back to Tewkesbury with the loss of eight or ten men before the house." So bare now was the countryside about Tewkesbury that the garrison had to forage as far afield as Painswick and Stroudwater to gather in supplies. In the spring of 1644 Colonel Mynne succeeded to Vavasour's command. Colonel Mynne was a far more energetic and resolute commander than Vavasour. He was feared and respected by the Parliamentarians, and Gloucester soon came under severe pressure. In April Massey made an attempt on Mynne's garrison in Newent, which, according to a Royalist account was beaten off, though it may be significant that Colonel Mynne withdrew his men to Ross for a while, leaving Massey free to forage for supplies as far as Ledbury. Massey was also active in the Forest of Dean in May, and took the Royalist garrisons of Westbury, Little Dean and Newnham. Corbel also records an undated attempt by Massey against Tewkesbury. Unfortunately, many of Corbel's accounts are not dated, and so it is difficult to fit them into the chronology. Massey sent his foot out of the west gate of Gloucester, and his horse to rendezvous with them; but in the evening he brought his horse back through the city to the Tewkesbury road. In the meantime an advance guard had been sent to secure Upton bridge, and was advancing on the western side of the Severn. Unfortunately the foot took too long to arrive and it was an hour after sunrise when they reached the town, "when we were not fit to assault awakened and prepared enemy," Corbet writes. They withdrew to await a better opportunity, which came on 5 June 1644. "After few daies the governor having breathed himselfe and his men, resolved to attempt the taking of Tewkesbury, a bad neighbour to our head garrison, and where he had suffered the repulse twice before. He was able to draw forth an hundred and twenty horse, and about thirty dragoons, with three hundred foot. For his strength was no more than the standing forces of the city, a great part of which were now swallowed up by the garrisons lately taken in. The horse and dragoons commanded by Major Ham-mond advanced some few houres before the foot and artillery, and were to alarm the enemy before the foot came up. They made a halt a mile from the town, and drew out a pretty strong forlome-hope, conceiving they may possibly surprize them, if they had not as yet tooke the alarm, and first three men were sent before to espy if the draw-bridge were down, and six more behind went undiscovered; next unto those marched the forlome hope, and the main body in the reare. In this posture they advanced up to the town, where they found the bridge down, the guards slender, the enemy without intelligence, and supinely negligent. On went the first party, killed the sentinels, a pikeman and a musketeer without match, and made good the bridge; the foriome-hope rushed in, and after them a full body of horse and dragoons, fell upon the guards, came up to the maine-guard before the alarm was taken, overturned their ordnance, and charged through the streets as face as the bridge Worcester way, where they took Major Myn the governour of the towne. The enemy threw down their armes, many escaped by flight, and many were taken prisoners. Colonell Godfrey was slain in the first charge, as also Colonel Vavasour's quartermaster-generall, and a lieutenant, all papists, besides a sergeant, with about six common souldiers. Our officers and souldiers supposing themselves wholly victorious, dismounted and went into the houses, some in the vanity of their humour, others for plunder, whilst all sleighted their own guards, and the making good of the bridge at which they entered, and ne-glected the taking and disarming of the maine-guard, which lay in the heart of the towne, and cleared every street. Whereupon those at the main guard observing the horse not seconded with foot, took courage to charge some of our horse now in confusion, and many of the enemy out of the houses ran to the guard, and so strengthened it, that they issued out upon our men, put them to a retreat, beat them out of the towne, and took some few prisoners. But before they were beaten out they had cut down two drawbridges, and secured the govemour Major Myn who was passed over the Seveme with a small party that tooke him beyond the towne. By this time Colonell Massey was come up with a few horse halfe a mile in the van of the foot, which hastened after to make an assault in this instant of time. But the bridge towords Gloucester was again drawn up and the workes manned on that side; here the governor placed his company of dra-goons, and gave order to fire upon them, whilst he drew his men round the towne, it being now darke night; but before he could reach the further end, where he entered about midnight the enemy were fled towards Worcester, being daunted at the first assault made by the horse, observing withall our foot now brought up, their ovine governor lost, their officers Blaine, and most of the common soldiers already rurme away. The townsmen through feare durst not give the least intelligence of what had hapned. By which means they were past the recovery of our horse already tyred, besides the night and darke weather hindered the pursuit. Only we tooke some scattering foot, to the number of foure and twenty, with a lieutenant. Upon our entrance we found eighteen barrels of powder, left by their haste, an hundred and twenty skeyns of match, two hundred new pikes, foure and thirty large hand-granadoes, good store of musket-shot, and two brass drakes. Most of their muskets were thrown about in the fields, ditches, and rivers, many of which were afterwards found, but the place itselfe was of the greatest consequence, and worthy of the service, being now a strong frontier-town, securing that side of the county, and commanding a good part of Worcester-shire: and in the nicke of time extreamly crosse to the intentions of the king's army. The enemy confect themselves to be neer seven hundred strong, when our whole body could not reach that number. That very day Colonell Myn was to march from Hereford to ayd this town: but prevented by our possession." Waller's luck ran out shortly after this, for he was badly beaten at the battle of Cropredy Bridge. Charles himself, after his victory there, advanced upon Tewkesbury, and his main body lay around Bredon Hill for two days, where, Corbet writes, "His Majesty being advised of the weaknesse of the place drew neere with a purpose to storme it, advanced the ordnance within a mile and sent out parties to skirmish" This proved of no avail and he withdrew. The King then marched south-west, to Cornwall, to a remarkable campaign that ended with the surrender of the Earl of Essex's army. Unfortunately for the King this was more than balanced by a major defeat in the north of England, when Rupert was defeated at the battle of Marston Moor. Locally, there was another battle when Colonel Massey decoyed the King's forces and then destroyed them. Mynne was slain in this battle at Redmailey in August 1644. The Parliamentarians were determined not to lose Tewkesbury again; it had changed hands many times, once three times in ten days. They strengthened the fortifications and Bennett mentions that; "twenty-five men were kept at work on it. The High Street men were working on Tuesdays, Wednesdays and Thursdays, the Church Street men on Fridays and Saturdays, and the Barton Street men on Mondays. He quotes from the accounts of one Mr Alye in the Corporation records which show how contributions were made: "for the maintenance of the garrison, the sum of £5,206.15s.2d. for the period August 1644 to July 1645". The payments made were then detailed: "the total charge for maintaining a company weekly, £21.16s.0d. ", for 80 common soldiers, a captain, a lieutenant and ensign, two sergeants, corporals and a drummer. This imposed a considerable burden upon the area. Other indications of the burden of the war, and the general dislocation of normal life, appear in local accounts. The Geast Charity Accounts show a drop in revenue in 1643 and 1644, and the treasurer claims allowance for the rents subscribed "which we cannot receive in respect of the deadness in trade and distractions of the time". No accounts were entered by the churchwardens for 1642-43, but the receipts for the following two years are very low, £7.8s.l0d. and £6.15s.4d., compared with a normal year, when they would have been around £35. In 1645 the initiative in the Civil War passed to the Parliament. They improved their forces and created the New Model Array, although the situation locally in the winter of 1644-45 remained perilous for them. Although the Parliamentary Committee for Worcestershire met in Tewkesbury for a time they had to be guarded, and Colonel Rouse was stationed there to raise a regiment of foot. The Royalists were still in the ascendancy in Wales, in the south-west and much of the Cotswolds. Worcester, Hereford, Raglan were solid Royalist bases. Sir Jacob Astley was at Cirencester, Sir John Wyntour was in the Forest of Dean, and from the end of December 1644 Sir Henry Bard was at Camden House. He raided for miles around. There is a warrant which he addressed to the parish of Twyning in November 1644, after the parish had failed to pay its monthly contributions. "Know therefore that unless you bring unto me at Worcester the monthly contribution of six months past ... you are to expect an unsanctified party of horse amongst you, from whom you hide yourselves (as I believe each of you hath his hiding hole) they shall fire your houses without mercy, and scare your ghosts." "Item, there was left at the decease of her said father fower bullocks, five prime and two young beastes, which were left and taken away at the time of war by the soldiers. Item, there was left a certayne quantity of oatswhich was taken away for the soldiers at the Garrison which was then kept at the White Cross in the parish of Lydney." In the spring of 1645 Prince Rupert gathered together a strong force of 2,000 horse and 1,500 foot and entered the Forest of Dean. Corbet refers to much plundering that went on there and the burning of iron mills. Rupert quitted the forest in the pursuit of Massey whom he came up with at Ledbury on 22 April. 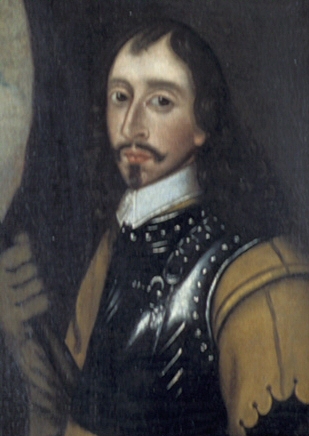 There was a fierce battle, and Prince Rupert is said to have fought a personal encounter with Massey, such was his reputation on the Royalist side, and to have shot his horse. However, Massey escaped in a running fight over four miles which must have alarmed the townsmen and garrison of Tewkesbury. In June the pressure relaxed, because the King's principal field army was beaten at the battle of Naseby, the third of the great battles of the war. This was followed on 11 September by the fall of Bristol. At this time the Roundhead Major General Poyntz was at Tewkesbury. He brought his horses over the Severn on boats so that he could keep an eye on the King. The area was still subject to frequent alarm. There were still Royalist forces in Worcestershire, and there was a garrison in Sir William Russell's house at Strensham, but the area under Parliamentary control was being extended. In December 1645 Hereford was surprised by Colonel Morgan and Colonel Birch, and the end for the Royalists came in 1646, when King Charles ordered Sir Jacob Astley to gather forces from the Royalist garrisons in South Wales, Shropshire and Worcestershire, and to take them to a rendezvous with his forces near Oxford, to provide another Royalist army to take the field. Unfortunately for the King they could not reach Oxford; Colonel Morgan and Colonel Birch caught them at Stow-on-the-Wold on 21 March 1646, the last battle of the Civil War, when the Royalists were defeated in a very hard-fought action. This left the King with only his garrisons in places like Oxford, Worcester, a few castles, such as Raglan, and small houses like Strensham. Worcester was besieged between May and July, when it was surrendered by Colonel Washington. This marked the effective end of the war in this area, although individual Royalist strongholds still resisted; Raglan surrendered in August, while Harlech Castle held out until March 1647. In reality, however, Stow-on-the-Wold and the fall of Worcester marked the end of the role of Tewkesbury in the Civil War.